1 How to win 6 months free shopping from Amazon February Quiz? 2.1 Ques 1) A leap year is a calendar year containing? 2.3 Ques 2) February 2018 will not have a single full moon day in the month. The last time this happened in February 1999. 2.5 Ques 3) Which of these is a western zodiac sign associated with February? 2.7 Ques 4) In India, National Science Day is celebrated on 28th February to mark the discovery of? 2.11 Ques 6) Which country is hosting 2018 Winter Olympics in February? 2.13 Ques 7) Which term is also used to refer to the first full moon of February? 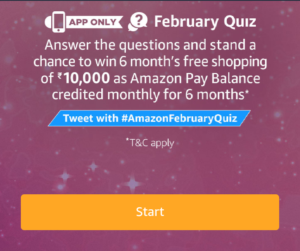 Amazon is back in the month of February with Amazon February Quiz and we added Amazon February Quiz Answers so that you can easily answer and win 6 months shopping. You have to answer 6 simple question and you will get a chance to win shopping worth Rs 60,000. So, read this post on Amazon February Quiz Answer for more info. 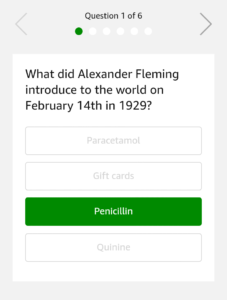 This Quiz at the last of the Homepage in the Amazon App. You will see the above shown image of Amazon February Quiz. One winner will be selected for shopping worth Rs 60,000. Rs 10,000 per month will be given to the winner for shopping at Amazon.in. So, answer all the question of Amazon February Quiz, and grab this awesome offer now. 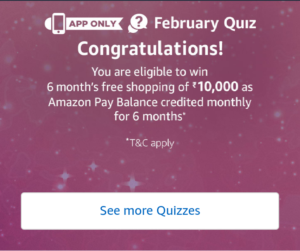 How to win 6 months free shopping from Amazon February Quiz? 2. Open the app and you will see a banner about the February Quiz Time contest. Click on it. Ques 1) A leap year is a calendar year containing? Ques 2) February 2018 will not have a single full moon day in the month. The last time this happened in February 1999. Ques 3) Which of these is a western zodiac sign associated with February? Ques 4) In India, National Science Day is celebrated on 28th February to mark the discovery of? Ques 6) Which country is hosting 2018 Winter Olympics in February? Ques 7) Which term is also used to refer to the first full moon of February? 5. After answering all 7 questions correctly, you will get a Congratulations message that you have been entered into a lucky draw. This Contest will commence on 1st February from 12:00:01 a.m. to 28th February 11:59:00 p.m.
A total of 1 (one) participants will be selected as winners of the Contest. The declared winner(s) will be eligible to win Rs. 10,000 credited monthly for 6 months, i.e. a total sum of Rs. 60,000 credited over a period of 6 months in parts of Rs. 10,000 each.